I’ve never been a big fan of superheroes but I can’t deny they do lend themselves well towards video games. With maybe the noticable exception anything based around Superman, it seems. Marvel Ultimate Alliance sees Dr Doom about to take over the world again and it’s up to you and your stable of superheroes to make him think twice. 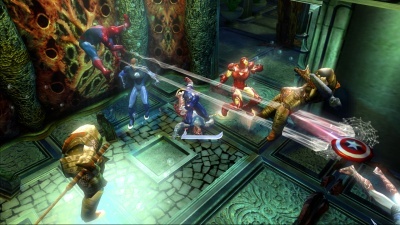 From a possible 20, you pick a squad of four characters and battle your way through a variety of levels themed around key characters from Marvel’s archives. The game itself is a button masher. Hammering A and B in various combinations will cause your character’s fists to flayal at everything in sight, whilst also throwing in the odd special attack this will probably be enough to see you through 90% of the game. That’s not to say combat isn’t fun. Depending on which hero you pick, different possibilities open up and the whole context of combat can shift. Plus, smashing your way through dozens of goons with over the top attacks can stay fresh for a suprising amount of time. What is a welcome break is the occassional boss battle. Every other is admittedly a “hit them until they die” affair, but the rest are thoughtfully designed and wouldn’t feel to out of place in WoW as they require some thought and/or teamwork to pull off. My recommendation, though, is only ever play this in multiplayer. No matter how engaging some of the environements are, solo mashing can be soul destroying. With Rock Band delayed until Spring, this was an automatic purchase. The chance to rock out again with an oversized Fisher Price toy was too much to resist, especially because this year’s guitar was wireless. 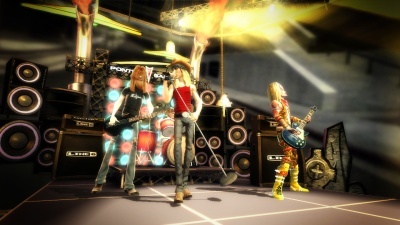 Guitar Hero 3 carries on where GH and GH2 left off; you strum your way through your “career” unlocking songs and making money as you go. Why change a winning formula? For me, as long as I can continually unlock new tracks then I’m a happy bunny. The new feature is boss battles where you must outplay an opponent, using power-ups to make them miss notes. The power-ups replace star power, so hitting a series of specified notes can cause your opponent to break a string, play twice the number of notes or make buttons reverse. Disappointingly, as they are a nice break, there are only three throughout career mode but it’s also available in multiplayer. Whilst it is “same old, same old”, it’s still great but for one exception: they have made it harder, and for no apparent reason. Even on Easy they have raised the bar needlessly which has already put Ali and others off from ever touching the series again, despite them having a reasonable success with the previous two outings. For a game that is supposed to appeal to the casual gamer, this is a horrendous oversight. Co-op career and it’s Live components saves GH3 for me, although I do hope the DLC helps severely expand the quality of songs available. Hmmm. “Game of the Year”? Can I have a “Game of the Year That Isn’t Halo” category? 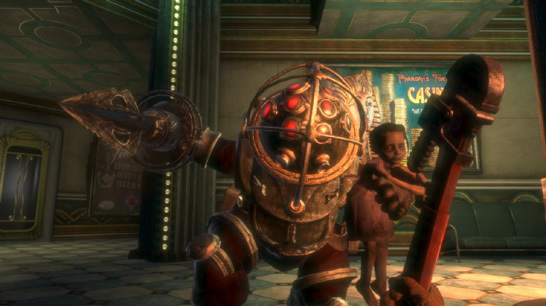 For me, it has to be Bioshock for its glorious look and feel. Here is a FPS come RPG that sees you wandering around a submerged world built at the end of WWII as a home where scientists and artists wouldn’t be constrained by others. The trouble is, everyone’s gone a bit mad and you’re looking for a way out. From the very first moment you set foot in the crumbling Rapture you are immersed in such a detailed and atmospheric world that you can only tip your hat at the developers for the sheer amount of effort that has gone into creating such unique environments. Looks would be nothing without a game, though, and whilst it has average-at-best FPS mechanics your ability to mix and match Plasmids opens up combat massively. Whether you want to freeze an enemy, set them alight, throw a swarm of bees at them, the choice is yours and the freedom allows everyone to tailor their own gameplay experience. Topping off this superb game is the narrative, which is second to none. I’m not going to give anything away but everyone who has played will know exactly which moment I am talking about when I say it caused me to take a step back in awe at how the player is woven into the storyline. If only the final boss battle didn’t exist I would be truly happy. I was supposed to be up in Scotland. I was supposed to be up in Scotland eating haggis and wishing Ali’s grandparents season’s greetings but instead I am house bound due to man-flu. Rather than pass this wonderfully festive ailment of cold sweats, coughing fits and general shivering on, I decided to sit around in my dressing gown catching up on recorded TV and writing up some blog posts whilst feeling sorry for myself. The theme of these posts are a brief roundups of all those games I’ve failed to speak about properly over the last few months. The twist is, rather than let myself ramble on forever I’ve restricted myself to 250 words on each… mainly because it hurts to stare at the monitor much longer than that. As the clock ticks towards half-midnight, I guess Christmas is truly upon us as it is now Christmas Eve. I’m up late finalising the wrapping of Ali’s presents and making sure that everything is ready to go for my manic day of ferrying family members, pets and presents around the county. It’s been building up to be a splendid Christmas, not least of all because Ali and I took her god-daughter to see Father Christmas on Saturday. Along with Sylvia’s mum Aoife, we all went to a village nursery and helped her meet the bearded present giver himself along with a couple of his reindeer. 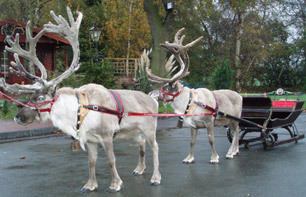 It was instant, joyful regretion for me as I hadn’t been to a grotto since my sister was ikkle and what particularly made it to me was how eight-month-old seemed wide eyed at everything, as you probably would be when meeting a reindeer whose head is as big as your whole self. Father Christmas even gave her a tiny packet of Cadbury’s buttons and she absolutely loved them. Whether it was the texture of the packet or that vivid purple, she refused to put them down all morning and waved them gleefully at anyone who wandered by. That was the true kick-off for Christmas for me as I’m still grinning from the experience. This will probably be my last post before Christmas as tomorrow is going to be insanely busy, so all that is left for me to do is to bid everyone of you a Merry Christmas; I hope Father Christmas is kind to you and that your day is merry and bright. Another afternoon armed with Pritstick and I now have some rather swanky results to show for it. All it needs now is some snow and the board markings and we’ll be in business. Thank you to Kindling and Crips Pink who helped make this all come together. 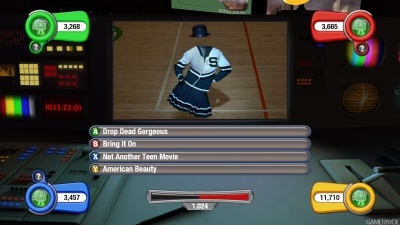 New to the Xbox 360 this Christmas is Scene It? (yes, with question mark), a family, movie based quiz game where players get the compete against each other in a series of Hollywood related rounds, buzzing in to answer questions using the new Big Button Pads. The PlayStation has had their equivalent now for several years in the form of Buzz and the general format is pretty much the same. Questions fired at you either require you to buzz in and answer or just hit one of the four coloured buttons to select the appropriate option, depending on how the round is setup. Either way, fast fingers earn big points and we all know what points mean. The twist with Scene It? is that it’s completely movie related. All the rounds are set around the backlot of a production studio and put you in screening rooms, on set, in special effect labs or the props department and all have you answering questions on various aspects of films. Inbetween rounds you fly in an out of these areas to fleshout the feeling that you’re on a hotshot producer’s set. This is a nice touch and aren’t overly long but can become frustrating if all you want to do is press on with the next round. What seperates Scene It? 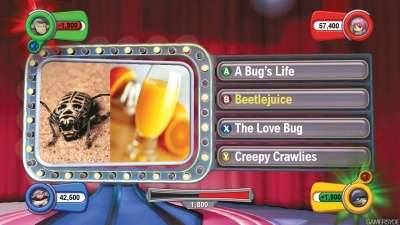 from Buzz further is its approach to the questions as they are far more interactive and make much more use of the fact that a simple quiz game has now been transferred to a console. You have the basic rounds, true, where you simply watch a clip and then answer questions on it but others go beyond that. My favourites are the movie poster round, where the poster slowly forms over time as elements swim in, and one which most resembles Pictionary where clues are drawn in real-time on the screen, both with the aim of guessing the film’s title before anyone else. To complete the description, there are also finish the quote, name the face, what’s missing here, timelines, who am I and various other basic clue and question based rounds, too. In fact, I would probably only say there was one question-answer setup, each round usually has its own twist. This is another example of Microsoft attempting to widen their 360 audience, another broad demographic title that is hoping to bring in non-gamers to the platform. Having been fortunate over the past few weeks to play this game with a small cross-section of the intended audience, it does seem to tick that broad box as both gamers and non-gamers alike have seemingly enjoyed playing Scene It? The rounds are varied enough to keep everyone interested and, best of all, the game actually saves out the questions you’ve answered to avoid it repeating itself. You also get the option of quick (20 mins) or long game (40 mins), as well as a party mode where it just fires off rounds at you with no need to set it all up. What does niggle, though, is occassionally the range of movies is too large. This may sound odd an odd statement but when Ali and I got a whole quiz where on pre-1960 movies which we’d never even heard of it took the fun out of it. Then again, I suppose it is the old addage of “it’s only easy if you know it” and someone else could have nailed them. Personally, I’m looking forward to any expansion they may do that utilises the simple controllers. If it could take the topics to more general knowledge areas or even think of new party games (beyond mini-game collections) then I’m all for it as a starting point to greater things. At the end of the day, it’s pretty hard to flesh out a description of a quiz game past “there are questions and you answer them”, especially as graphics and sound are pleasant but functional. If you have a group of people who are willing to enter into the spirit of this interactive board game then you shouldn’t be disappointed. It’s fun, reasonably paced and on a topic everyone should at least by able to join in with. The saga continues, but this time with a positive end. Towards the tail end of last week Xbox Operation contacted me with a view to helping them test and give feedback on the new video store on Xbox Live Marketplace. Given my previous experience I thought it wouldn’t hurt and that if I could be of any assistance in identifying my blocking issue then so much the better. Armed with a generous 1,000 points I set about the Marketplace looking for the smallest movie I could find to download; after all, if it was going to fail I wanted it to fail quickly. However, low and behold, all 1.1GB Analyse This successfully downloaded at the first time of asking and in only 40 minutes. Buoyed by my success I went directly to my nemesis, Harry Potter and the Philosopher’s Stone. Whilst taking slightly longer due to it’s HD-ness, it too managed to land complete and watchable on my hard drive. The interesting thing I have learned from these experiments over the weekend is that you are actually able to watch the movies as they download. This may sound like a no brainer but this interesting feature was hidden away in a list of bullet points at the time of launch and I think deserves mentioning. Basically, if you’re downloading a standard definition film, you can pretty much start watching it only five minutes into the download, which is fantastic. Anyway, my opinion has now been reversed and it is once again something that I now eagerly await new releases for. We’ve still to watch Analyse This plus Zodiac and the cult Clash of the Titans also await viewing, the only problem now is fitting them around all the Christmas specials. After writing my Happy Birthday Viva Piñata piece a couple of weeks ago, it seems the article has attracted the attention of other sites. 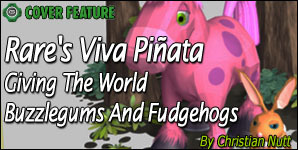 Firstly, and most predictably, the Rare website has taken it and placed in our Viva Piñata section. It’s a good feeling to see it nestling in amongst Horace St. James Golightly’s pinatathropological pieces. Secondly, and more surprisingly, Gamasutra have decided to do an article and a news story based around it. What’s particularly special is that this time I get on their site without Marketing or masturbation being mentioned once, which is nice. I know this is really nothing more than an ego boosting post but it really does warm the cockles to still see that others out there are still as enthused by VP as I am and that it warrants some column inches.